This year's Route 66 Sportive is being held on Saturday 27th April 2019. We have three courses available: BRoute 99, Route 66 and Route 33. BRoute 99 is new for 2019 and is intended to provide that extra challenge over and above what we previously offered. Start and Finish will be from The Lodge, Chetwynd Deer Park, Newport, Shropshire, TF10 8EU. 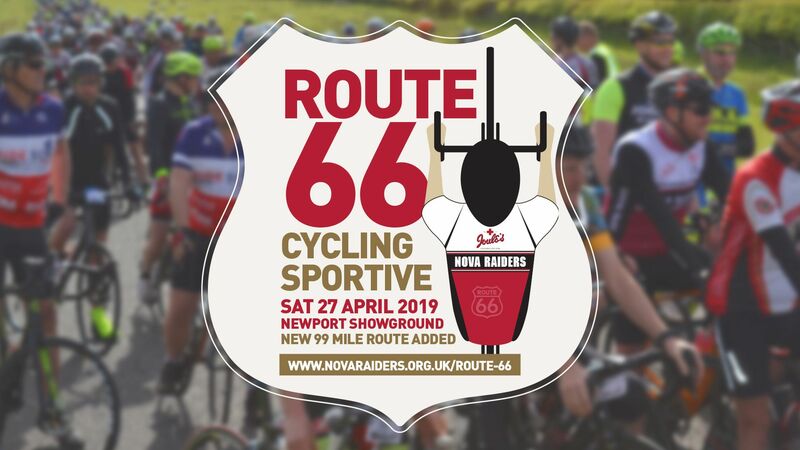 Nova Raiders will be making a donation of all proceeds after costs to Severn Hospice, our local hospice, that has touched the lives of many of our members in some way. Cycling through the beautiful Shropshire countryside with iconic views of The Wrekin, Long Mynd and the Shropshire plains. Come and join us for a fabulous day's cycling and socialising in the beautiful Shropshire countryside. It promises to be an amazing day! All proceeds will be donated to charity as this is one of the core values of our club. We'll nominate the charity a little nearer the time of the event. All routes are fully signposted with marshals and support crew. Water stops at Upton Magna and Wrockwardine (all three routes). Feed stations at The Bog Visitors Centre (BRoute 99 only) and - Cardington Village Hall (Route 66 and BRoute 99). Mechanical support at the start. Tea and Coffee available at start. Mens and ladies toilets available. Food available from the fabulous Camper Hamper. Refreshments available including the Joules Craft Beer Bus licensed bar.